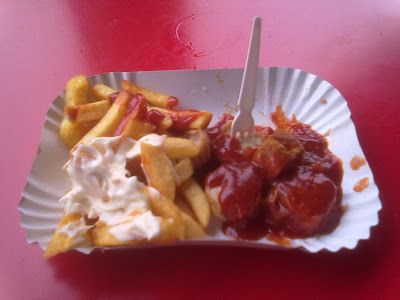 When one hears the name 'Berlin', one of the many things that comes to mind is Currywurst. The currywurst can be considered a national symbol of Berlin, while Konnopke's Imbiß (seen below) is a national monument in itself. Just below Eberswalder Straße subway station, many tourists (even locals!) flock to Konnopke's just to sample their infamous currywurst. Fried, lightly dusted with curry power, and served with a side of french fries or potatoes with mustard, ketchup, or mayo, this is something that is done right only in Berlin (although some may argue that the currywurst first came from Hamburg). But the question now is - who does it better? I got the chance to sample Konnopke's, but I also got the chance to try homemade currywurst. Although Konnopke's lives us to its reputation (they've got great fries and mayo too! ), I'd still have to say that homemade currywurst was definitely better (nothing beats homemade food)! Sorry Konnopke's. You know I've slowly been learning this lesson too. I keep forgetting it but whenever I get all excited to go to a restaurant and eat their food, I remember that eating the real thing at home never (or rarely) disappoints. Whereas restaurants have really been letting me down lately. Sad but true.